Tis the season for giving and with this magical Merry Christmas gift tag set from our friends at Amanda’s Parties To Go you can give a gift made with love. 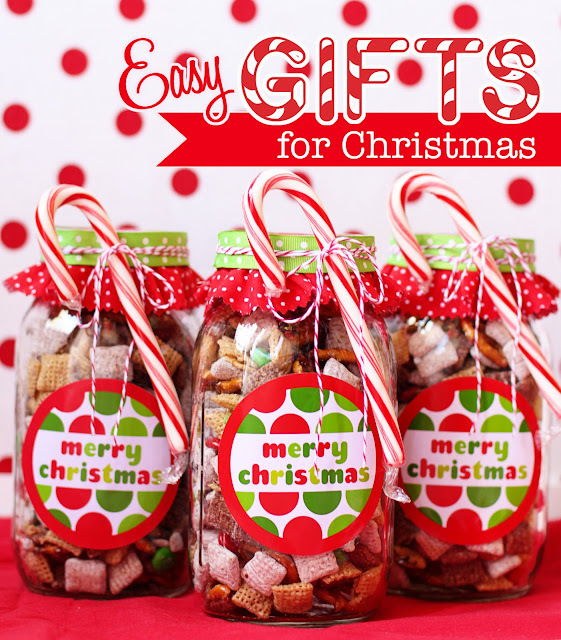 In this post you will learn how to create a unique handmade gift by using Twine, Mason Jars, Small Pieces of Fabric, Candy Canes and of course label sheets. Over the weekend I was busy finishing up gift projects for neighbors, friends, and my kids’ teachers and friends. Always on the lookout for fun, homemade gift ideas, I sometimes make my own Chex Mix in large batches to give away at the holidays. 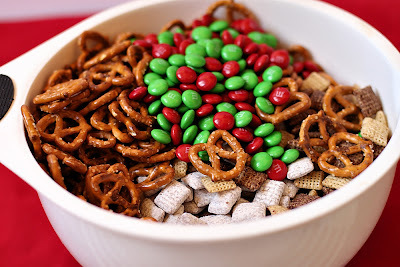 With the baking involved in making Chex Mix, however, it was going to take a bit more time than I had to give this year. Instead, I came up with a new, no-bake version that actually turned out really yummy. 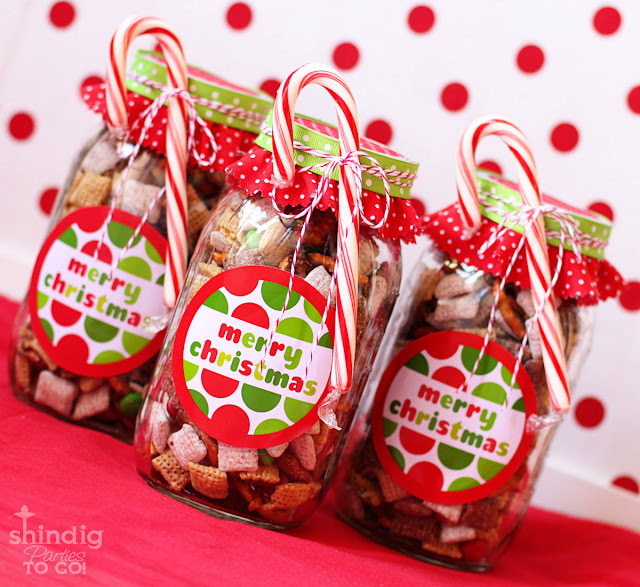 I packaged the mix into quart size mason jars and used Amanda’s Parties To Go’s latest FREEBIE MERRY CHRISTMAS TAGS to make stickers for the front of the jars. 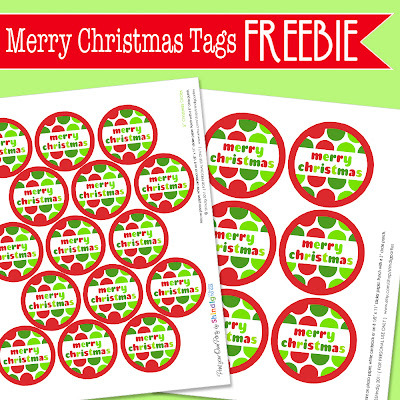 You can DOWNLOAD the FREE CHRISTMAS TAGS HERE And if you download, I would LOVE for you to support Shindig Parties by becoming a FAN on FACEBOOK HERE…. Just click LIKE! The freebie set includes a page of 2″ circles and a page of 3″ circles. You may use circle craft punches to punch the designs out or you may carefully cut with scissors if you don’t have access to the punches. I recommend printing onto glossy sticker paper from ONLINE LABELS HERE. After printing, cut close to the designs with scissors and then punch each one out with your circle craft punch. two large bowls and mix together. 3. Cut circles from a Christmas fabric approximately 5 1/4″ in diameter. Use pinking shears for a fun edging if you have a pair. Screw on the jar lid over the fabric circle. 4. Using hot glue, adhere an approximately 3/4″ wide ribbon to the side of the jar lid. 5. 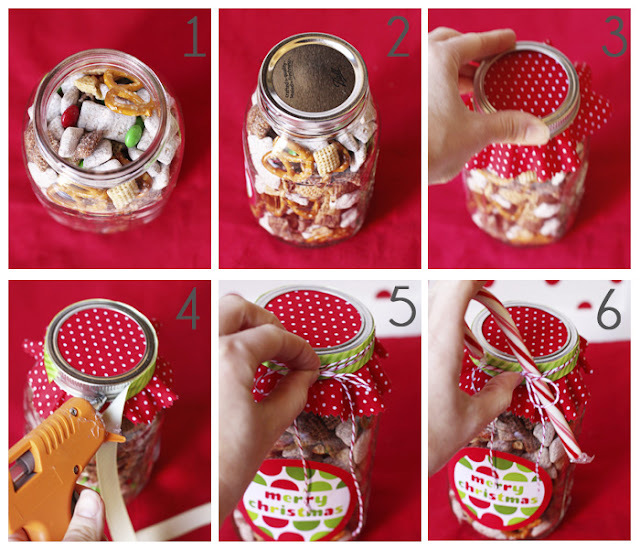 Wrap some red & white bakers twine around the jar lid a few times and tie into a bow. 6. Add a candy cane under the bow for a sweet embellishment. You can make jars and jars of these in just a few hours. No excuses…. go spread some cheer through the neighborhood! Any idea how long this keeps? I want to make it ahead! 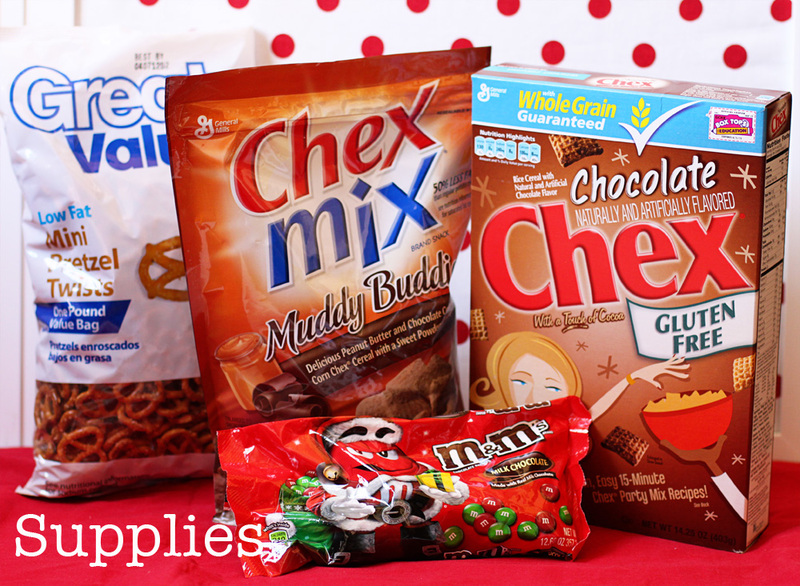 Just make sure you go by the expiration dates on each of the individual ingredients!